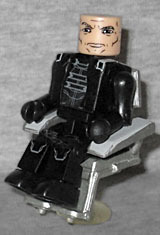 In the year 2023, Charles Xavier lives in hiding with his fellow X-Men, orchestrating the mutant resistance to a mutant- and human-eradicating army of robotic Sentinels. He uses a one-of-a-kind hoverchair. Among all the (very) cool stuff Days of Future Past did, one of the best had to be the inclusion of the iconic hoverchair. It may not have looked like the '90s classic, but the connection was clear. Showing how dire the X-Men's straits were, this was the first time Professor X wore an X-uniform, rather than his regular suit. It's black, with grey lines for the details, and he's wearing a small jacket. The chair is silver and gray, and has a clear stand to make it hover. Sadly, it's slightly too large for Xavier: his feet dangle. In hiding, the Erick Lensherr of 2023 lives among the X-Men he once fought, using his magnetic powers to battle the Sentinels who have purged all human and mutant life from the globe. 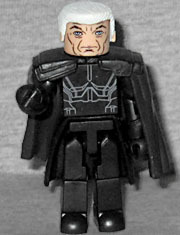 While there have been Magnetos and Professors X before, this is the first time there have been movie-based versions. But weirdly, both of these actors have had Minimates in the past - McKellan got one for Gandalf, while Patrick Stewart was Captain Picard!